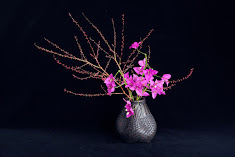 The sixth of the ten virtues of Ikebana is constant scent. If you take up Ikebana, you can always be surrounded by the nice smell of flowers. Ikebana artists know which flowers work best for them and their family and friends. My favourite is a sweet olive, osmanthus fragrans. I was delighted to find this plant is available in Australia as well as in Japan and it’s growing so well in my newly planted garden. As any aroma therapist will tell you, scents really affect our moods and feelings. Even when we feel a bit depressed, the scent of flowers always cheers us up. That effect should not be underestimated. It can be more than a temporary change in psychological state. Especially when we are really stressed or anxious about something, scents can help us stop our negative thinking and gain new insights. For instance, we may realise we were losing sight of the more important things in our lives. Such an experience could help us lead a more spiritual life. That’s the power of flowers. 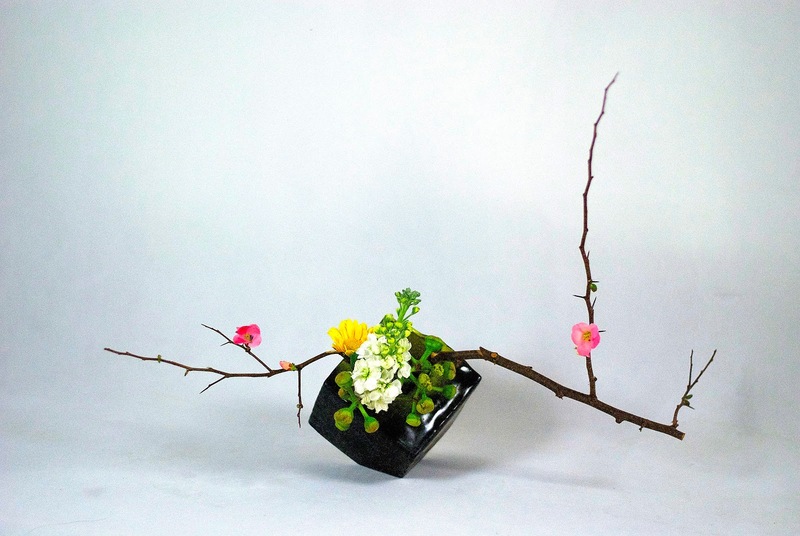 Don’t you feel like taking up Ikebana now? I used a cube shape container for this month’s work. I put a cross bar inside the container to fix flowers. To emphasise the zigzag features of the container, I used Japonica branches which have zigzag lines. I place a yellow gerbera as an accent at back of white stocks for a naughty effect.